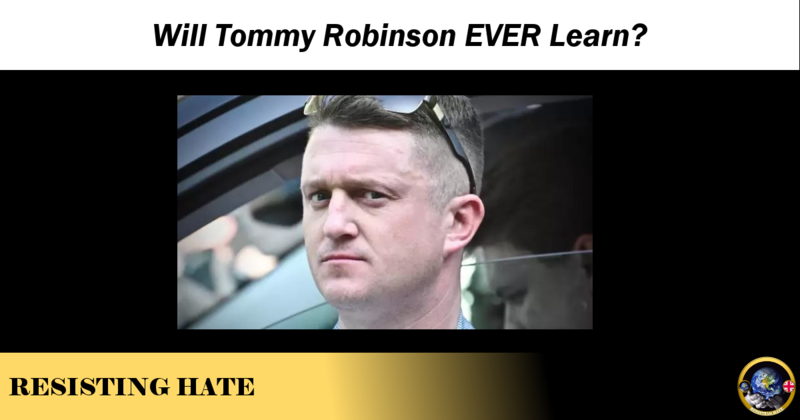 Will Tommy Robinson EVER Learn? I was hoping to write a piece this evening about the success of British justice and the banging up of far right hate preacher Tommy Robinson. Unfortunately that article (and the accompanying bottle of champagne) has been put on ice for a few weeks. However today has managed to yield a few noteworthy moments worth reflecting on. Alleged, Mr Robinson, Alleged. He’s not ‘getting done‘ he is standing trial. Innocent until proven guilty. Just how many times do you need to be told this before it finally sinks into that head of yours? Anti haters and fascists alike were surprised when in the first few minutes of his much hyped trial at London’s Old Bailey Robinson’s lawyer asked for a trial adjournment. After spending about twenty minutes in court the whole thing was put back to late October. 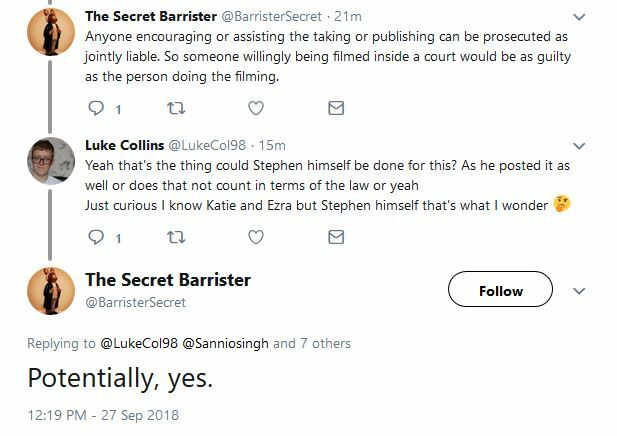 This raises the question whether or not Tommy himself knew that his legal representative was going to ask for an adjournement. If he did then why did he let his supporters incur the costs of travelling to London for a trial he knew would never take place? If he is so grateful to his followers why did he let them spend money on travel and take annual leave off work for nothing? And if he didn’t know then why not? Legal counsel are supposed to act on their client’s instructions. Tommy and his crew estimated the crowd of his supporters to be around 1500-2000 people. However estimates by the Met Police put the crowd around 300 people. We do have a picture of the crowd taken from inside the old Bailey (and we’d agree with the Met’s estimate on crowd size) but for legal reasons we are currently unable to publish the image. Interestingly the reason we have this picture is because Tommy’s ex boss – Ezra Levant of Rebel Media – flew over from Canada to support his ex employee and made a video while on the premises of the Old Bailey . Unfortunately for Levant it is actually an act of contempt of court to shoot footage or take unauthorised photographs on Court premises. So ironically Levant came to support Tommy in a trial for contempt of court and has ended up being investigated for doing exactly the same thing himself! You couldn’t make these idiots up! Outside the Court the supporters were not exactly covering themselves in glory either. 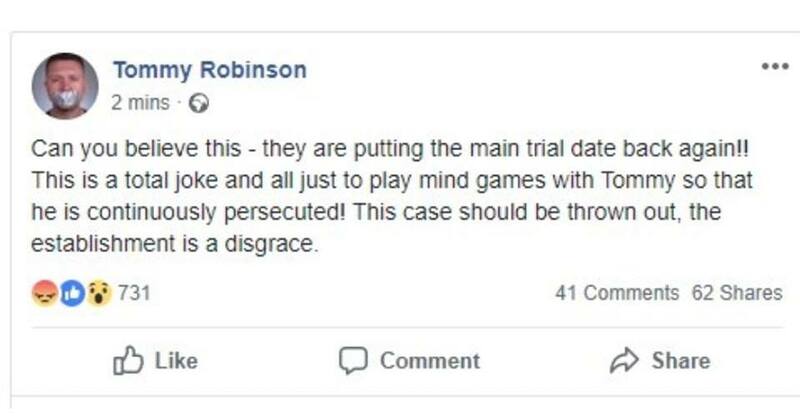 The police had anticipated Robinson’s rabble rousers would cause trouble (see the threats we published yesterday from supporters openly threatening violence on his Facebook page). 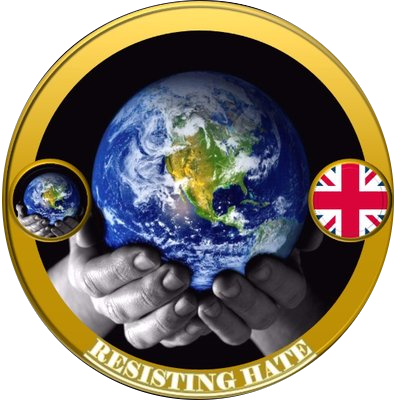 The Met advised pubs local to the Old Bailey to close which was good advice as last time Robinson’s supporters got together members of the crowd drank too much lager, started performing Nazi salutes and attacking the police. One woman attending the peaceful counter protest was assaulted for carrying a placard which was violently wrenched out of her hands. A journalist was spat on for reporting on the court case. And to really finish the day off in style it was reported that staff at the Old Bailey had to clean human excrement from the front door of the court. One might think that after a day of watching his supporters brawl, spit and (in what I very much hope was an isolated incident) throw their own excrement at one of the most respected courts in the country, Tommy might decide to take a night off and spend some time with his family. He founded the EDL, he has a criminal record for violence, there is substantial evidence of him making racist comments and racist ‘jokes’. The man is a thug and a bigot. Read the articles on our website. All are fully sourced and provide genuine screenshots as evidence. where is the evidence, if you can prove he’s a racist, then i’ll stop supporting him ! 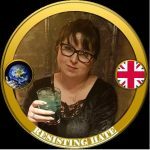 There is an article on the site which provides screenshots of Robinson being racist. Read it. can you show me the details and the link? Can you use a search button? Resisting Hate are self funded.